There is a celebration going on right now. 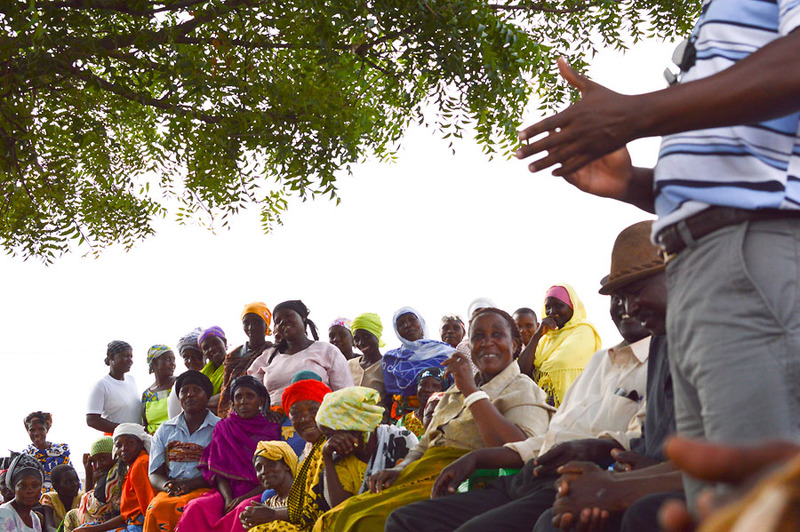 The villagers of Toloha, Tanzania are filled with hope because you are here visiting this website. We are thrilled with them that you are interested in Toloha Partnership! Read about all the amazing things that are happening in Toloha and here in the USA as we partner with the people of the village to make their lives better in so many ways! We would love to hear your thoughts in the comments on the blog. Get updates about what is going on in Toloha here and in our e-Newsletter. 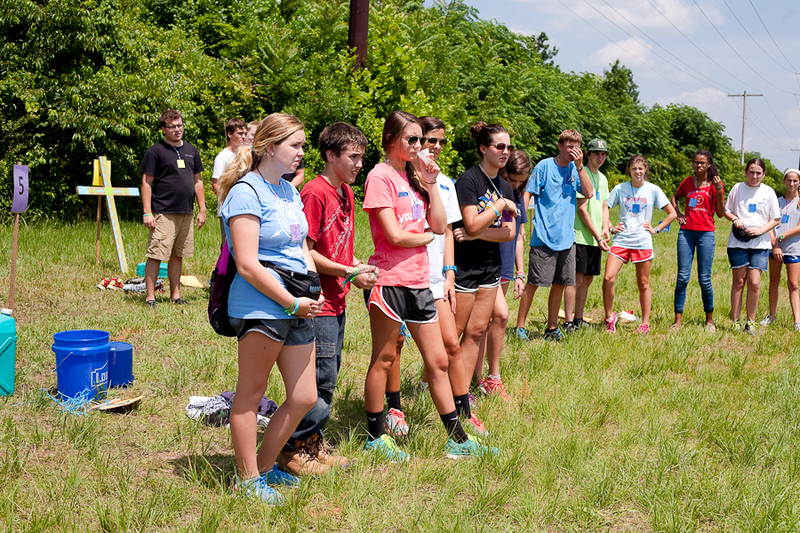 While our Toloha Vision Team was preparing to leave for Toloha, Erasing the Lines was happening in Kinston. Erasing the Lines or ETL is an amazing annual event for middle school and high school students. 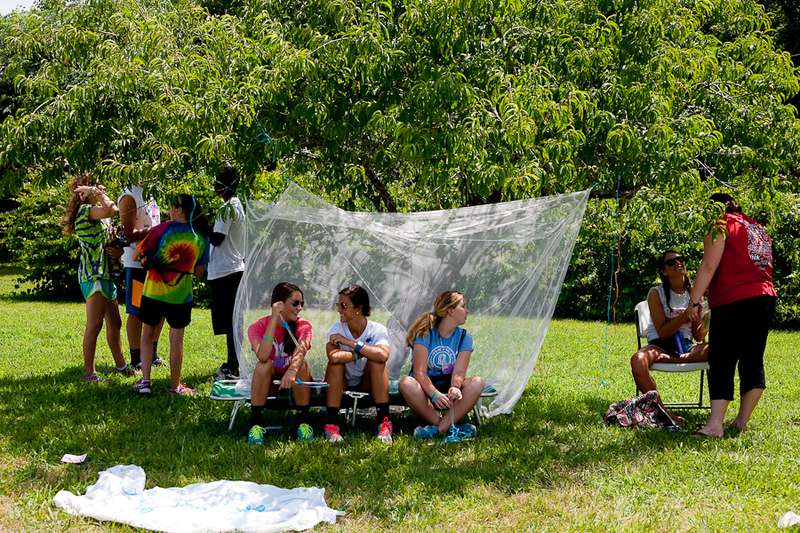 The students participate in community projects, Vacation Bible School, worship services, missions activities, Bible Study and more in Kinston and around Lenoir County. Around 190 students participated in ETL this year, and Toloha Partnership was privileged to share with them about Toloha for the second time. 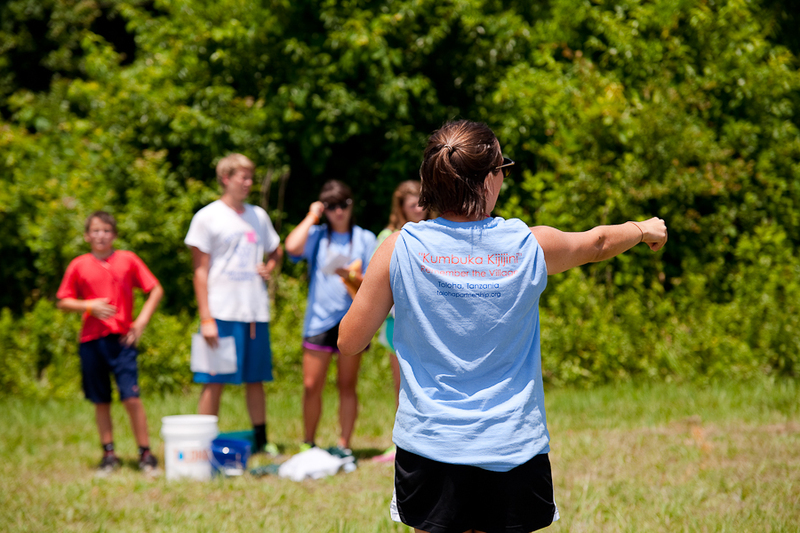 Last year, we held our very first water walk with the ETL students (Click to see a post here and here and watch a video here). This year, we gave the students a little glimpse of what it might be like to live in Toloha. The students were given different roles as villagers, put into families, given a certain amount of money and assigned an occupation. They learned how the villagers gather water, wash their clothes, sell things in the market and care for their families. They were also given an opportunity to write letters in Swahili to the villagers, sing songs in Swahili, write in prayer journals and pray for specific people and projects in Toloha. It was pretty amazing! Check out some photos from the day! 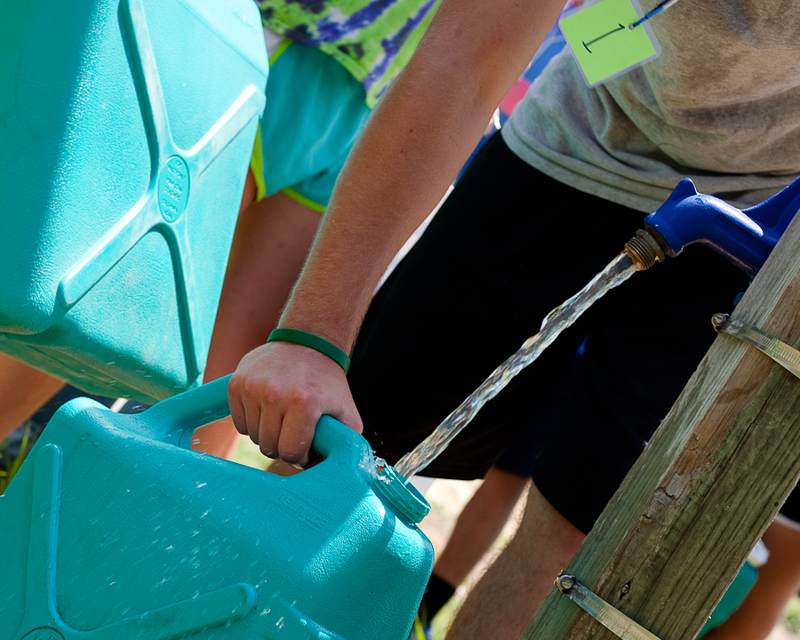 Students collected water from a spout similar to the one the villagers use in Toloha. Students were able to sell “clothes,” “firewood” and corn at the market. Students were put into “families” given roles and “money” to help their family survive. Students learned how villagers do laundry in Toloha. Students learned how the villagers must conserve water while washing their laundry. 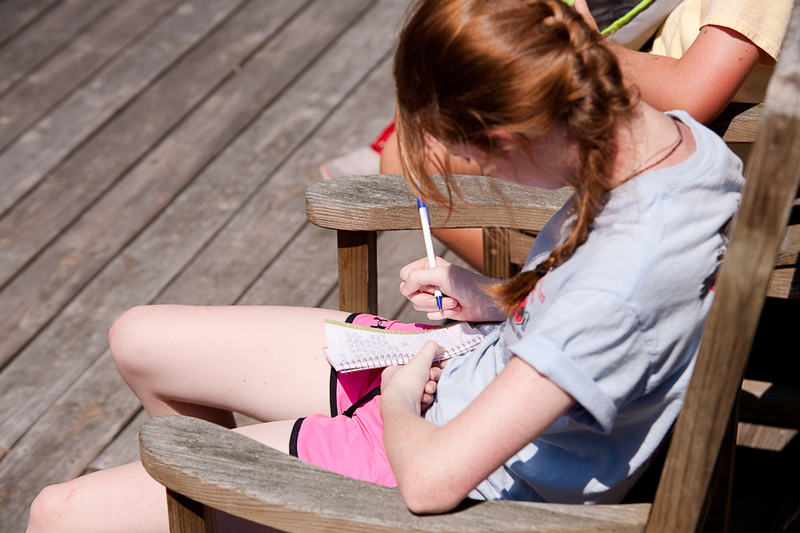 Students wrote prayers for Toloha in a journal. Students gave a try singing a worship song in Swahili. 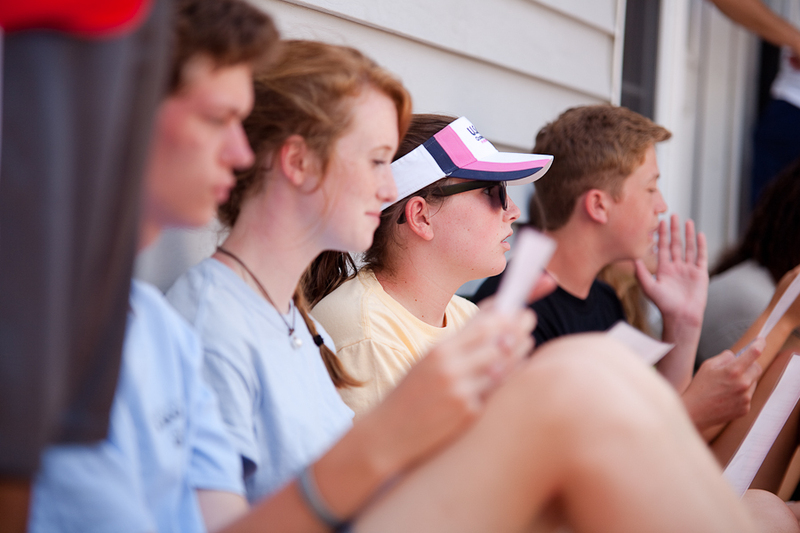 Students were given index cards with names of people in Toloha or specific prayer requests on them. They prayed aloud in a group for the items on the card. A huge thank you to our amazing volunteers who ran the Toloha Station! 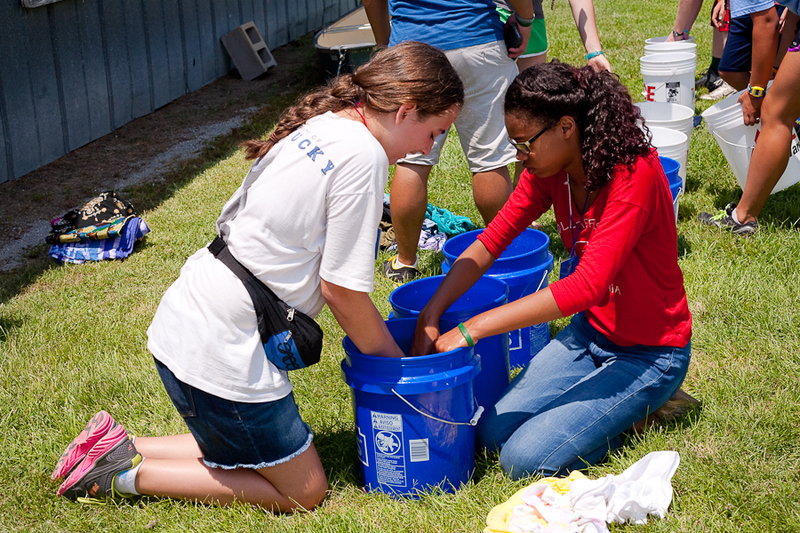 We would love to do a similar activity with local youth groups, schools, VBS or college groups. If you are interested in learning more, please contact us or email us at info@tolohapartnership.org. The villagers are digging the trench by hand. Katie also called to report a few things. She said that portions of pipe have already been laid into the trench and covered with dirt. 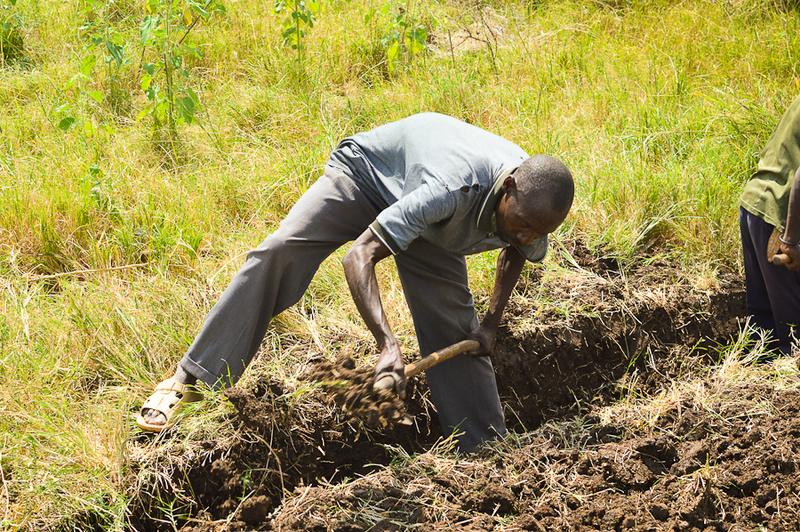 The Toloha Water Board (villagers chosen to manage the water system) is taking initiative and overseeing the trenching and food-for-work program. The corn has arrived in village for the food for work agreement with the villagers. 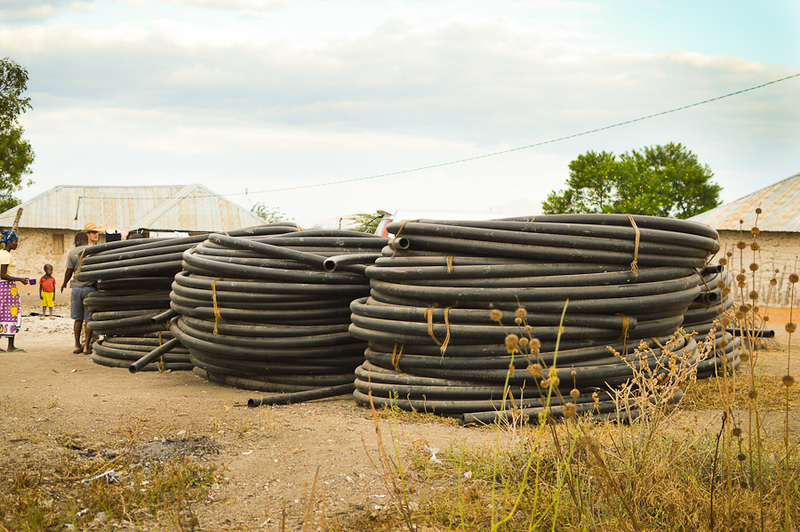 The villagers will receive food for work after a certain length of pipe is finished. One morning, the team was awakened to the sound of the villagers getting 3 oxen to pull the pipe off the spools down the trenchline. The villagers are so excited to get the pipe in the ground, and even the animals are helping to get it done! Praise God for all the work that is being done! Continue to pray for the villagers as they finish this task and our team as they travel on Thursday. As we were speaking at about 5 pm (in the village), they were having a July 4th party along with the villagers! 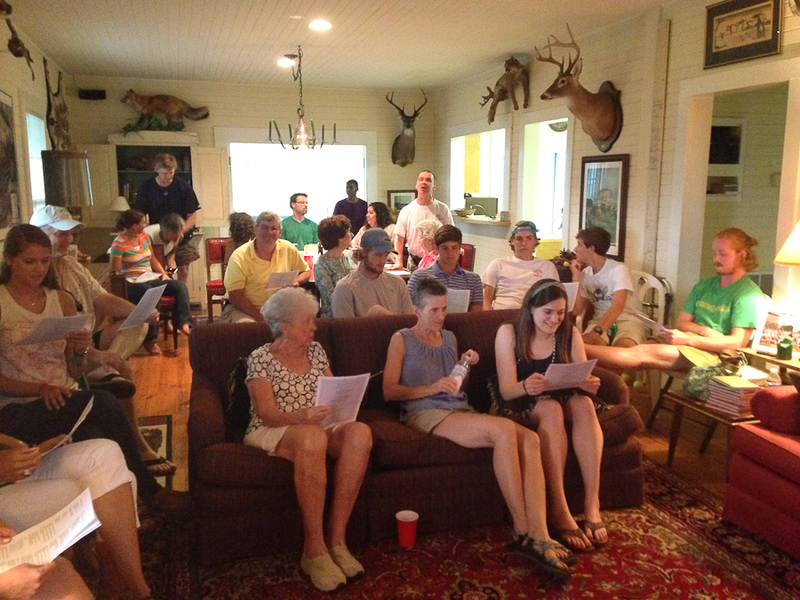 The team also showed the Jesus Film to the villagers on the 4th of July and forty folks came! The Gospel was clearly shared! The villagers broke ground on the trenches for the pipe Thursday after a very productive and unifying meeting with the water board. 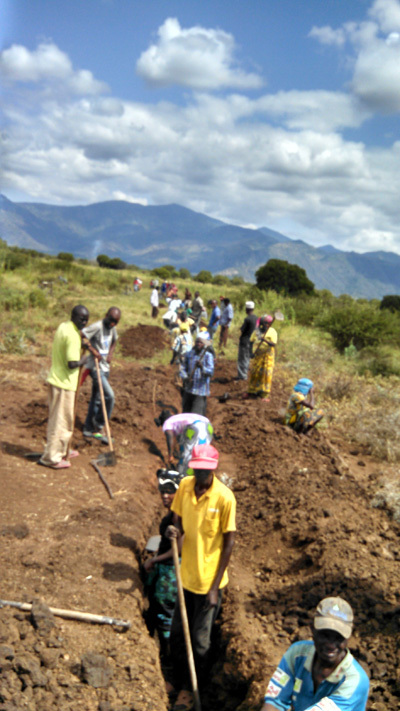 They dug 100 meters all day for free (no food for work compensation) to symbolize their commitment to the project and partnership, and they were able to get a lot accomplished. The team climbed to the intake site yesterday. It was a rugged climb, but they made it. Even though there is plenty of water work to be done, great progress has been made. The water committee met yesterday with lots of clapping going on. Every meeting so far has exceeded our expectation. The food for work plan starts Monday. Burt was very enthusiastic about how the Lord has worked and ordered the process in a miraculous way so far. Keep praying for this to be a smooth and constructive process and for it to build unity and God’s love amongst everyone involved. Josh led a ministry meeting with a group of about 10-12 Christians and some from our team to begin talking about the state of the church there in Toloha and discipleship through Bible study and housechurch. These villagers were very enthusiastic about their first Bible study using the Mini-Bible College audio Bible and lessons with 10 or 12 folks on Monday! Please pray specifically for that meeting that these precious people would continue to grow in Christ and in their knowledge and understanding of His Word to the glory of God. Ashely said that our team members were having some fun soccer games out in the field with the local children. She said all on the team are healthy and in good spirits. The village elders gave the team a gift of chickens and eggs, which was such a generous gift and was amazed our team. Ashely, Brooke and Katie have also been able to spend a lot of time with the women of the village learning about their daily routine. Every team member plays a vital role. God has knitted it all together. God is good and answers prayers! Thanks be to God! KEEP PRAYING FOR ALL! 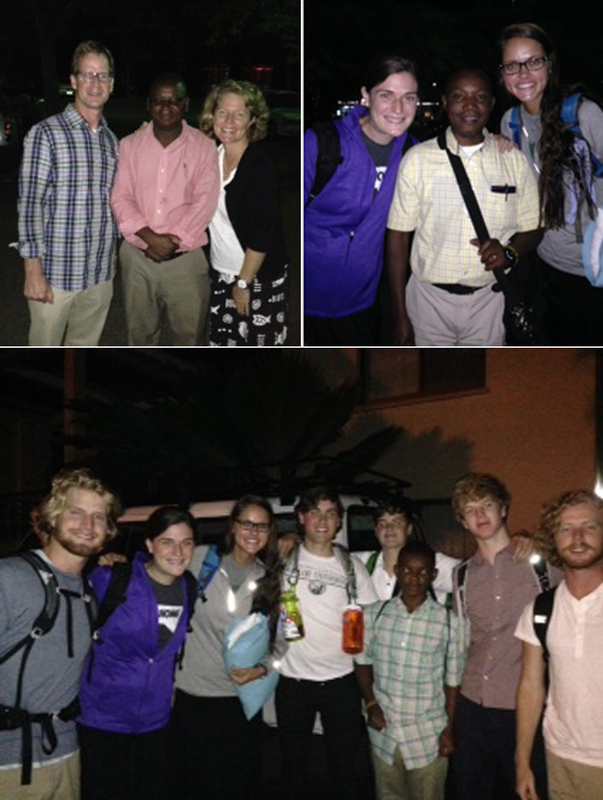 The Toloha 2014 Vision team has been in Toloha for 2 nights, and there has not been a dull moment. We are praising God for all that has already happened. God, through Burt, Leyton, and Daniel, led an awesome water meeting under the village tree, and then the digging of the trench began TODAY! A unity among the team and the villagers and the water board is being achieved – answer to prayer! 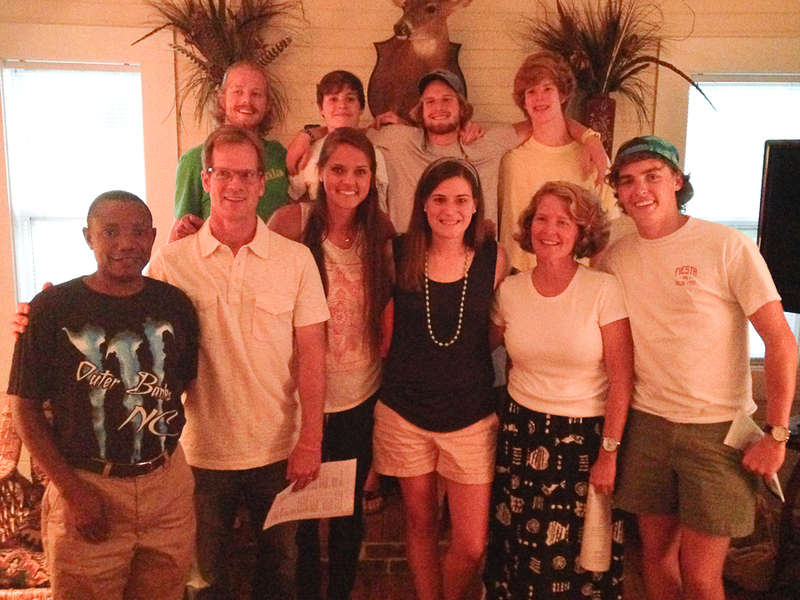 Eight villagers came to a ministry meeting to learn about starting a Bible study, and they are very excited! There were 2 young women, 2 young men, 2 older women and 2 older men at the meeting. How God is supplying the needs – including the ministry of the villagers is amazing! There have been several other highlights for the trip. The team was invited to Massai ceremony. They walked to water source with village! The village is SO grateful they are there. All doing GREAT! 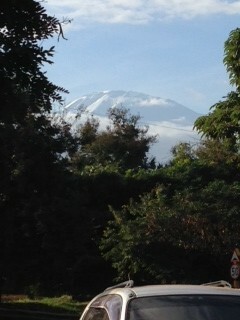 Some successful bargaining adventures yesterday AND saw Mt Kili! Majestic and not always easy to see because of the usual cloud covering. Spectacular! 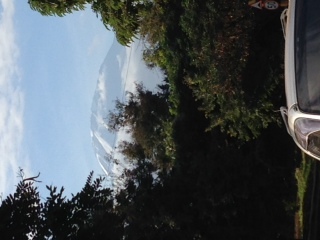 We have been sharing specific prayer requests for our Vision Team while they have been traveling and are in Tanzania. We ask anyone who would like to pray with us for our team! Here is the first list of requests: Prayer Guide for the Vision Team. Please continuing praying! God would be glorified by EVERY aspect of the trip. Trip dates: 6/28-7/21, Daniel & Joshua stay through 8/4. Each one on the team, as well as the Tanzanians with whom they work and share, would have a personal and powerful encounter with God. The unconditional love of God would radiate in and through each team member. All on the trip would be sensitive to the leading of the Holy Spirit. God would give the team strength and good health throughout the trip. God would protect and provide for family members back home. Team members would make quick adjustments to time and culture changes. God would put a hedge of protection around the entire trip. Divine appointments from beginning to end. (Read a little about the 2014 trip here, and here, and the 2013 trip here, here, here, and here). 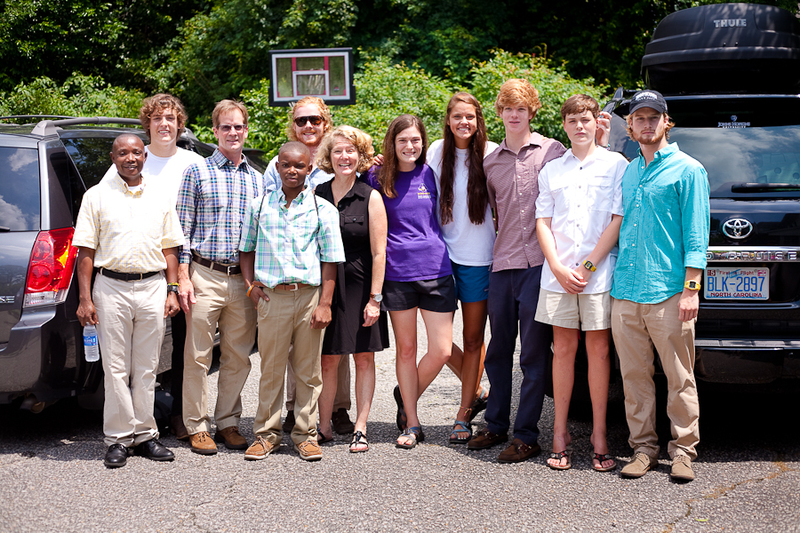 Today at noon, the Vision Team left Kinston and began the journey to Toloha, Tanzania. It is amazing to think that within days our team will get to see with their own eyes the new pipe in Toloha. This trip will be so much different than the last one now that the hope of clean water is becoming a reality to the villagers (Read a little about the 2014 trip here, and the 2013 trip here, here, here, and here). We are so excited to share with you first hand about what’s happening in Toloha for the next month. In the meantime, we have a request. 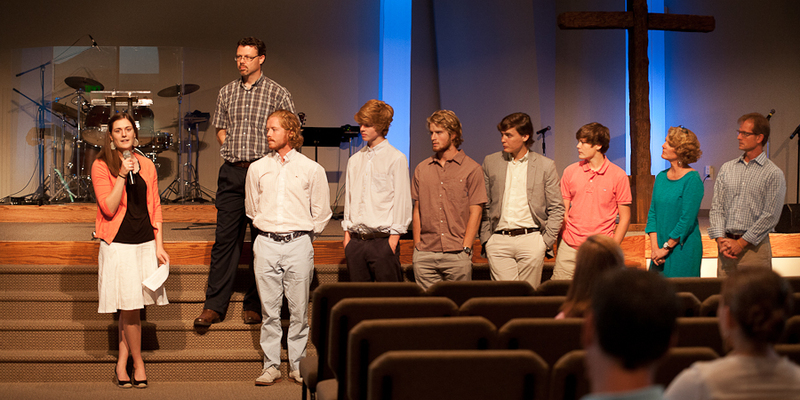 Last Sunday, our Vision Team was commissioned by Grace Fellowship Church. We would like to ask for anyone who would like to join them in prayer to pray for these specific things. We will be posting specific requests over the next few days. First, we have some requests regarding the water project. God would guide Burt, Perry, and their team as they assess and construct the spring-fed pipeline and as they assess other infrastructure needs of the village. Villagers would feel a sense of their worth to God and to us as they partner with us in the construction of the pipeline. Dealings with the government officials and village leadership would be free from dissension and controversy and that the water project would help to create goodwill and unity among all parties for God’s glory. The repair of the intake area would proceed smoothly and efficiently. 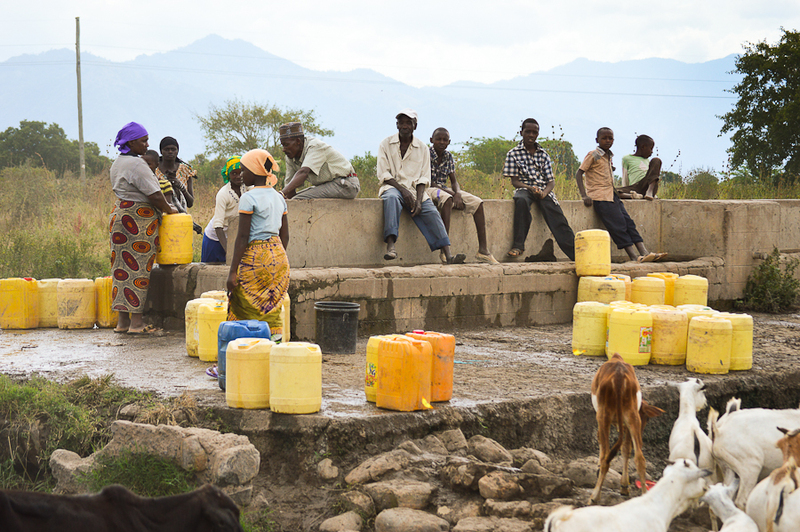 God would provide clean and healthy water to the village soon but within His perfect timing. Thank you so much for your prayers! If you would like to receive special prayer requests and updates during the trip, please fill out the form below. It is hard to believe that a year has passed since we sent the first team to Toloha Village. 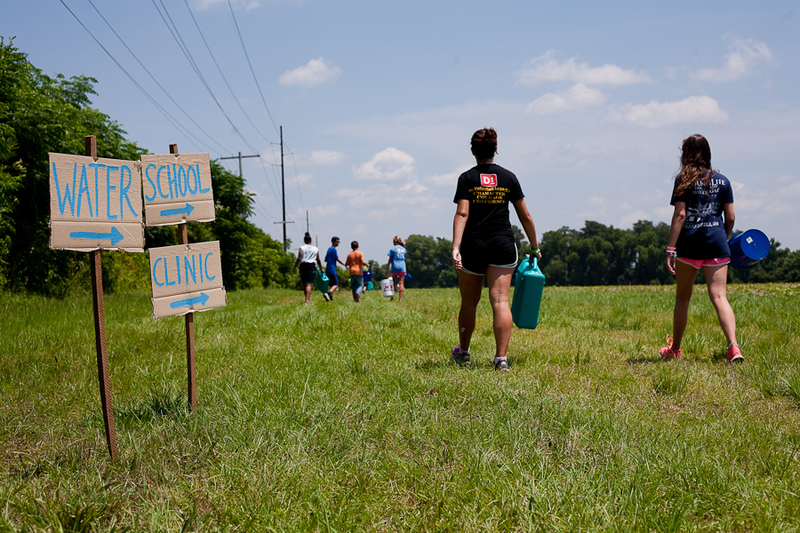 All we knew at that point was the villagers needed water and we wanted to help! God has done A LOT in just a year. 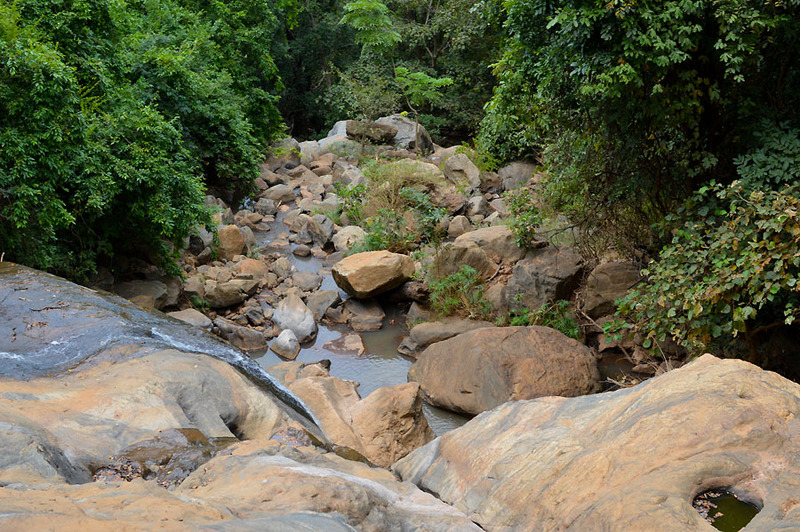 We now have definite plans to pipe water in from a mountain stream with a budget of ~$170,000. We held a fundraising banquet and auction in November raising $35,000. In March we held our 2nd annual Water Walk and had over 150 participants from across the community raising $28,000! We’ve seen many individuals both young and old be moved by the story of Toloha. People across this community have caught the vision for Toloha and are passionately praying, working and fundraising for the people in the village. With a year like that behind us, we cannot wait to see what God has in store this year as our second team boards a plane in less than a week to begin the journey to Toloha. 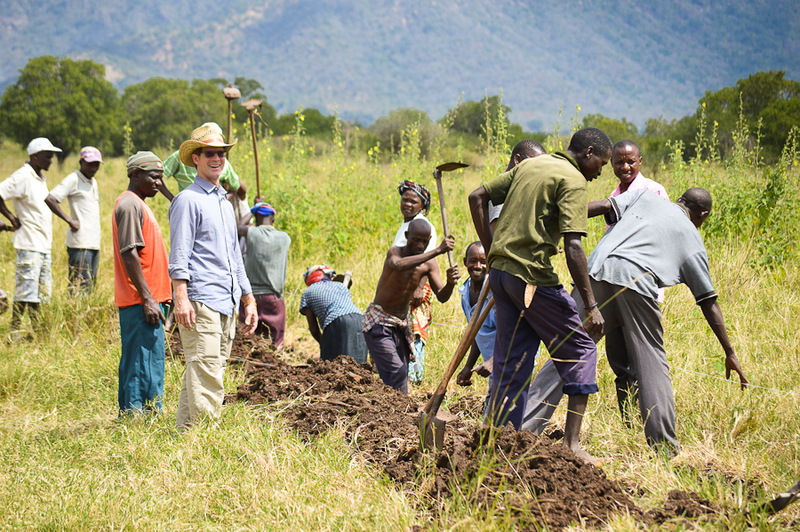 As most of you already know, Toloha Partnership is, in part, a water project. And yes, we are bringing them clean water and most of our fundraising efforts (Water Walk and Banquet) are going toward a water pipeline. But, the real heartbeat of Toloha Partnership goes deeper than water – our heart’s desire is not just to bring the people physical water but to tell them about Jesus. This year as the team goes to Toloha they are still working to bring the villagers clean water BUT they are really focused on the people – on building relationships, listening to their stories, telling them about Jesus and casting vision for the future development of the village. Our partnership with the village of Toloha is a long term partnership, not just a water project we do for a few years and then move on. Over the past 2 months the vision/travel team has been meeting at least every other week to cast vision, pray, study, plan and fellowship. This has been so valuable – the team has been walking through a video series of what poverty is through a Christian worldview and how to address it in a way that empowers the people and gives a hand up rather than a hand out. On Saturday, friends, family and board members gathered for a feast of some African cuisine that we might be eating during our stay in Toloha, and then they covered us in prayer for our time there and for the people of Toloha. With all of our current budget directed toward the water pipeline, each team member has raised their own financial support and thanks to the creativity of many, a ministry budget has also been raised. A separate team has been working diligently to figure out just how we can effectively share the truth of the Gospel with a people of a different language and culture. Thanks to the ministry budget, the team now has access to many resources in Swahili that will help them to proclaim the Gospel! We have solar powered MP3 players with the Bible and expository teaching in Swahili, we have Swahili tracts, we have the Jesus Film in Swahili and we have access to Bibles in Swahili. Going to Toloha is pretty uncharted territory but God has been so faithful to confirm and to lead us to this point and we have no doubt that he will continue to do so. We do not know what every minute or hour will hold as we go to Toloha, but we certainly know who holds each of those minutes and hours. We are thrilled, and a little nervous, for what is ahead. We would truly appreciate your prayers as we go. We will be posting a prayer list right here within the next few days. You can also fill out the form below to receive updates about the trip while we are there.